"[An] aspect of Villa's economic overlordship deserve[s] special attention: his attitude to the money supply. ... An economic simpleton, Villa saw no reason why he could not simply print the money he needed, and to an extent the American banks in El Paso colluded with this by accepting his currency at eighteen-nineteen cents on the dollar, on Villa's guarantee. Villa's assault on market orthodoxy was more difficult to handle, especially when he gave the poor of Chihuahua fifteen dollars each on Christmas Day 1913, and then fixed the price of staples: beef was to be sold at seven cents a pound, milk at five cents a quart and bread at four cents a loaf. 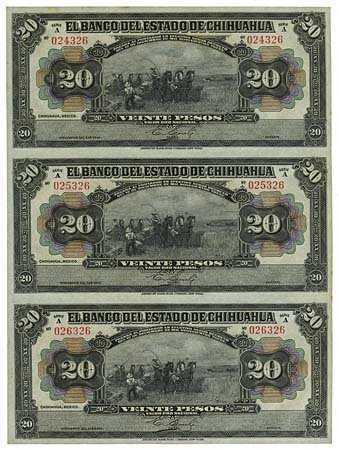 "Mexican merchants tried to evade Villa's price­ fixing by pricing their goods on a two-tier system, one price quoted against Mexican silver money, the other against Villa's paper money. Villa retaliated by ordering a mandatory sixty days in jail for anyone caught discriminating against his currency. When that measure failed to work, and people continued to hoard silver and 'real' bank bills, Villa declared that all such money not exchanged for his currency at par within a week would cease to be legal tender and its holders treated as counterfeiters. This tough measure panicked the hoarders into disgorg­ing."